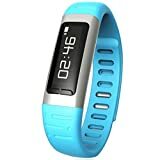 ANDROSET Digital Bluetooth Smart Watch Waterproof Wrist Smart watch Pedometer Wi-Fi Hotspots For iPhone Android Samsung Anti-lost function. Features: 1. Material: Steel Silicon 2. LCD: LCM 0.91 inch 3. Resolution: 128x32 4. Wi-Fi Hotspots: High-speed Internet access, Zero flow through to the end. (Insert Watch into the computer USB port after Pre-installed driver in Computer and setting, then you can use .) 5. Ringing reminder when you receive a call 6. Display the number or name of incoming calls 7. Dial Size: 7.4 x 1.78 x 0.88cm 8. Ringing reminder once your mobile phone disconnected 9. Anti-lost alarm function: When cellphone left watch alarm automatically, after a certain distance to avoid lose the phones. 10. Feature: Caller ID, Reject Call, Alarm Clock, Pedometer, WIFI, Clock, Burglar Alarm etc. 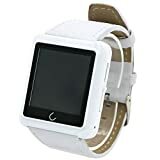 Bluetooth Smart watch Bracelet Wi-Fi Hotspots Pedometer Sleep Monitoring Remote Camera for iPhone and Android Phones Note: It has no microphone and loudspeaker on the watch. therefore it can not use to answer or receive call. However, it can remind you when you have a call and use it to reject call. About ANDROSET: ANDROSET a USA brand developed in California and offers Home entertainment technology solutions including media streaming entertainment devices for the TV, remote, air mouse, gaming accessories, networking devices, HDMI cables, adapters and more. ANDROSET IS SOLD BY ONLY AUTHORIZED RESELLERS TO ENSURE PRODUCT WARRANTY. 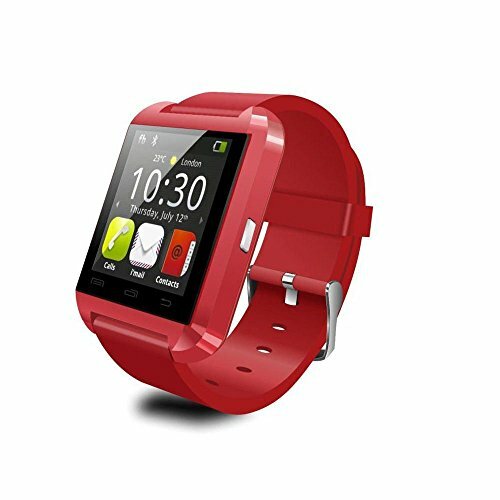 ANDROSET Bluetooth SMART WATCH, a nice smart companion to Android OS devices; It has many differents functions such as: Bluetooth, phonebook, dialer, messaging, call log, notifications, music, remote monitoring via camera, settings, power saving, barometer, pedometer, stopwatch . FEATURES: Touch Screen: 1.48" Capacitive Touch Screen TFT LCD *Time / Date / Week / Battery state display. *Ringing reminder when you receive a call, *Ringing reminder once your mobile phone disconnected *Display the number or name of incoming calls *Answer or Dial calls from your wrist *Stopwatch function *Support hands-free calls, phone book *Play the music in your phone (after Bluetooth paring) *Sync SMS/call history(only for android phone) *Ring reminder when your Android 2.3 or above smart phone receive a message (including Wechat, Facebook, Twitter,WhatsApp, Skype) *Anti-lost alarm function: When cellphone left watch alarm automatically, after a certain distance to avoid lose the phones *Remote taking photo function:You can control your cellphone to take photo from your wrist. (only for android phones) *Altitude Meter,Passometer,Photograph, Barometer, Vibration Package includes: 1 x Bluetooth Watch 1 X usb cable 1 x User Manual About ANDROSET ANDROSET a USA brand developed in California and offers Home entertainment technology solutions including media streaming entertainment devices for the TV, remote, airmouse, gaming accessories, networking devices, HDMI cables, adapters and more. ANDROSET IS SOLD BY ONLY AUTHORIZED RESELLERS TO ENSURE PRODUCT WARRANTY. ANDROSET Bluetooth Smart Watch for Android and iOS FEATURES: 1.48" Capacitive Touch Screen TFT LCD -Time / Date / Week / Battery state display -Ringing reminder when you receive a call -Ringing reminder once your mobile phone disconnected -Display the number or name of incoming calls -Answer or Dial calls from your wrist -Stopwatch function -Support hands-free calls -Play the music in your phone (after Bluetooth paring) -Sync Phone book/SMS/call history(only for android phone) -Ring reminder when your Android 2.3 or above smart phone receive a message (including Wechat, Facebook, Twitter,WhatsApp, Skype,and so on) -Anti-lost alarm function: When cellphone left watch alarm automatically, after a certain distance to avoid lose the phones -Remote taking photo function:You can control your cellphone to take photo from your wrist. -Altitude Meter,Passometer,Photograph, Barometer, Vibration Specifications: -Material: Steel + Silicon -Bluetooth Version: Bluetooth V2.0+EDR -Bluetooth Protocol: A2DP + HFP 1.5 + HS P 1.2 -Range of Frequency: 2.4GHz spectrum -Language Support: English, Chinese -Charging Time: about 1 hour -Talk Time: about 3 hours -Music Play Time: about 6 hours -Standby Time: about 160 hours -Power Supply: Built-in 230mAh rechargeable battery Note:Android System can support all function in the description;BUT IOS only support:Passometer,Calendar,Call Sync,Calculator,Clock,Stopwatch ANDROSET a USA brand developed in California and sold/shipped by limited authorized USA sellers to ensure product warranty. WARNING: AUTHENTIC ANDROSET PRODUCTS ARE NOT SHIPPED FROM CHINA! 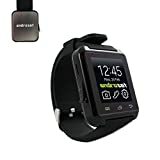 ANDROSET Bluetooth Smart Watch Leather Strap Wristwatch Sync Phone Call SMS APP Notification with E-compass Pedometer Anti-lost Sleep Monitoring for Android Cellphones. Features: Caller ID, Reject Call, Alarm Clock, Pedometer, WIFI, Clock, Burglar Alarm etc. Three-axis Magnetic sensor, 3D Gravity sensor, Special noise reduction, Microphone, Look for mobile phone: can make your phone ringing the bell, easy to find. Music play after you sync your phone. Taking Pictures: Remote control pictures Self-Timer, remote Sound Recordings keep a record of the moments of your life, Remote Video, keep a record of precious image. Anti-theft: Have "Smart Anti-theft", function when you are shopping, by bus and metro etc., no need to get out your phone, you can Answer and Dial, and it will send an Alarm to remind you out the distance. Power saving: Built-in 250mAH polymer Battery, more durable and more secure! Charging can be filled with two hours! Standby time 8.5 days, Talking time 3.5 hours. Sleep quality monitoring: To monitor the quality of your sleep, make sure your healthy sleep, at the same time, remind you on time when the precise timing coming. Note: 1.To sync the notifications, your phone need to install the software (for android system only). 2.For Android phone, every function mentioned can be used, but for IOS phone, only Sync phone call, E-compass Navigation, Sleep quality monitoring, Anti-lost, Music play, Look for phone and Pedometer. About ANDROSET: ANDROSET a USA brand developed in California and offers Home entertainment technology solutions including media streaming entertainment devices for the TV, remote, air mouse, gaming accessories, networking devices, HDMI cables, adapters and more. We are passionate about excellence so that with every ANDROSET purchase, you can expect to premium quality, reliable performance with affordable pricing, and with tech customer service. ANDROSET IS SOLD BY ONLY AUTHORIZED RESELLERS TO ENSURE PRODUCT WARRANTY.